The local Les Gets/Morzine ski area contains 48 lifts servicing over 120km of pistes. One of the best features of this stunning area is its ability to cater for skiers of all levels and abilities. The terrain varies from wide, gradual motorway runs to sumptuous powder fields and steep, funnelled couloirs; whichever you prefer, there will be something here to suit you. In recent years the beginners’ ski area in Les Gets has undergone a lot of changes. It’s now a large, self contained area comprised of 4 secure pistes, serviced by 4 designated lifts: 2 magic carpets, a snow cable and a rope tow. All this can be accessed by the new red bubble lift from the town centre, so is entirely pedestrian friendly. The American Indian themed “Grand Cry” mini-boardercross is a fun way of introducing the more technically difficult aspects of skiing and is right next to the beginner’s zone (and serviced by a very gentle chairlift). It comes with Wild-West decor, music and tipis! There are even drawing contests and treasure hunts to entertain. For younger children there are nursery slopes in the village, where your little one will learn how to use a lift and ski down a gentle slope (from age 3). 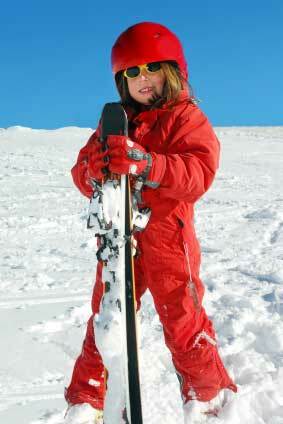 We have more info on children and families skiing in Les Gets here. Les Gets spends a huge amount of time and resources on grooming pistes, so once you’ve mastered the beginners’ area there are plenty of gentle, well-groomed blues to ease you into your new occupation as expert skiier! 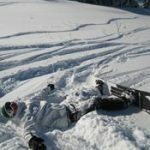 Those with prior skiing experience will find plenty to amuse them in the Les Gets bowl, with its wide array of well maintained blues and reds. The lesser known Mont Chery area is a hidden gem – due to its position on the edge of the ski area, it’s always uncrowded. The videopark in Les Gets is a fun way to check out your own skills on the piste. For advanced skiers, Les Gets offers exciting off-piste possibilities in the Chamoissiere, Nyon and Mont Chery areas (see video below), as well as a number of challenging black runs, including the Yeti mogul field. There’s a snowpark for the more acrobatic skiier, complete with kicks and rails, as well as a newly-developed boardercross. What can we say? Great chalet, great hosts, great weather, great skiing! We love Les Gets, skiing excellent again this year – we’ll be back. Our first time in Les Gets, with a mixture of skiing abilities, and there was something for everyone. Great food, fab chalet and great resort. It's why we keep coming back every year! We thought about writing a little article about this most debated of topics amongst snow-lovers.